The Gerald Schoenfeld Theatre provides at least 10 infrared assistive listening devices for every performance at the theatre. Beginning 4 weeks after a show’s official opening night performance, at least 10 audio description devices are available for every performance at the theatre. In addition, there is unlimited access to downloadable audio description software for personal mobile devices, available beginning 4 weeks after a show’s official opening night performance, which provides an automated detailed account of the visual of the production, free of charge, for blind or partially sighted patrons. The theatre also offers hand-held devices and software that provide captioning for deaf or hard of hearing patrons, available beginning 4 weeks after a show’s official opening night performance. Additional devices can be available with at least 24 hours’ notice by contacting Shubert Audience Services at 212-944-3700 or audienceservices@shubertorg.com. There is also a representative at the Shubert Audience Services kiosk at every performance to assist any patron with the audio description devices, software, or captioning devices. 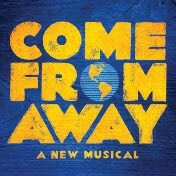 Come From Away provides real-time translations, on your mobile device. Language Subtitles are available in Spanish, Simplified Chinese, Japanese, and Korean. For more information, visit the Shubert Audience Services kiosk inside the theatre. Located on 2nd level, up 1 flight of stairs (31 steps). Please Note: On the Mezzanine level, there are approximately 2 steps down per row. Entrance to Mezzanine is behind row K.
A wheelchair accessible restroom (unisex) is located on the main level. Additional restrooms are loocated down 1 flight of stairs (20 steps) in the Lower Lounge.